Are You Embracing Digital Transformation? Your business must innovate to survive, and innovation goes hand-in-hand with digital transformation. There is a growing digital divide between those embracing and those ignoring digital transformation. Which side of the digital divide are you on -- transformational or traditional business approaches? The response to digital transformation is underwhelming, according to a McKinsey&Company report summarizing recent survey data. The results indicate that most companies have a plan, but they are tentative. Investment in digitalization has been modest, being directly proportional to the revenues they are generating. The report goes on to say that many companies appear to be treading water rather than moving forward with the digital transformation. This leads to the conclusion that there is under-investment, especially with the Internet of Things, automation, and predictive maintenance. Innovation is not a new concept. In this day and age, innovation is a process that should be integrated into your business lifestyle -- it is necessary for survival. Once you start innovating, you can never relax. If your innovation is copied by others, then it is no longer innovative. It is more than a new product or service. It is also how that product or service is purchased and supported. You need to create a culture of innovation that gives everyone a role in building your organization's success. Don't depend on a single person, but instead build an innovation team. Build your team one person at a time -- Get to know your workforce. Anyone could be a valuable team member. Consider personalities when evaluating and selecting team members. Extroverts may try to dominate, while introverts may not contribute. Look for those that confidently present well-thought-out ideas while contributing to the decision-making process. Look for diversity; include marketing, sales, IT, product development, finance, production, and distribution. Your team should reflect the backgrounds and cultures of your customer profiles. Make team membership part of the best career path. All ideas are open for discussion -- A mediocre idea may result in productive discussion that could lead to a great idea. It is risky to explore a new idea, but then it may be the next great opportunity. Recognizing and considering each person's thoughts are key to encouraging active participation. Don't create a static team -- Rotate members; don't assume that the present team members will always be innovative. A lack of new ideas and bureaucracy are common roadblocks to innovation. Team members need stimulation and inspiration. The more that team members interact with others at seminars, conferences, trade shows, and on-site job shadowing, the more ideas will surface. Direct the team spirit only towards your competition -- An original idea for a unique product or service may have only months before it is copied. Don't let internal competitiveness, intellectual arrogance, or jealousy sabotage your success. Internal competition can divert time and resources. Collaboration trumps internal competition. Know the customer -- You should know what matters to them. You can then anticipate and meet their needs and desires. Research your customer demographics, lifestyles, incomes, and generational buying habits, but don't assume that they will not change. Cultivate the customer relationship as part of your innovation. The first major trait of those embracing digital transformation is that they don't make minor modifications to their traditional business models. It is very likely the digital reinvention process will cause significant changes in business strategies and the nature of core business. Digital reinventors are twice as likely as traditional incumbents to embrace digital transformation, launch new businesses, and have built digital business models into their core business. Those embracing digital transformation are also seven times more likely to digitize the corporate business models. The second major trait is investing more decisively. 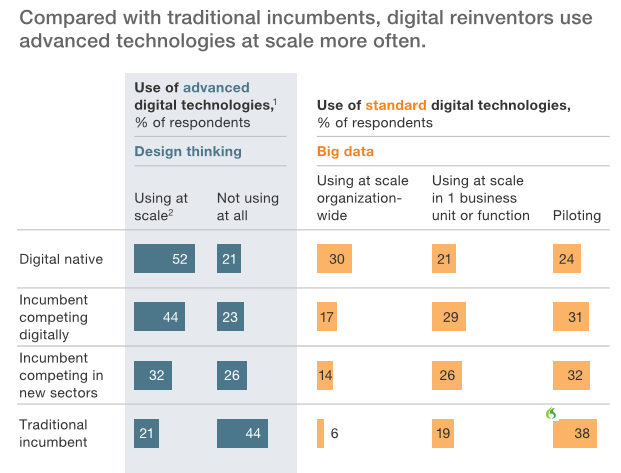 The McKinsey survey discovered that digital investments for reinventors are three times higher than for traditional incumbents. However, digitization is not just a matter of spending more money. The investments are bolder as well. The surprise is that only 15% of the survey respondents said they have acquired new digital tech/digital businesses in the last three years. Another of the real differences for those embracing digital technology are they used far more of the cutting-edge tools and technologies. It is likely that you are going to embed the innovative technologies in your existing organization. Remember, that if you're successful you need to scale properly to support your customers. The McKinsey survey reported that 44% of incumbents said their companies use design thinking to scale as seen in the chart below. 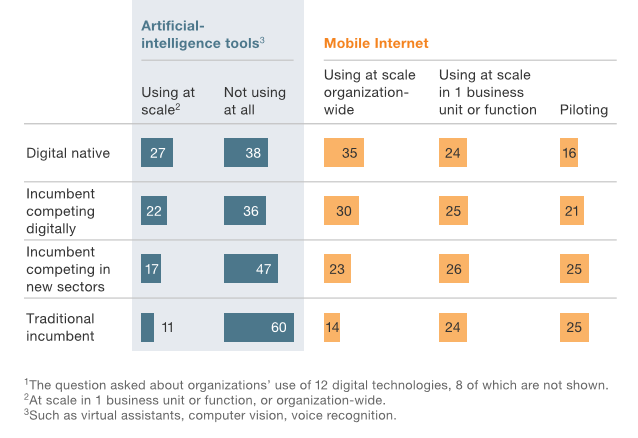 Artificial intelligence (AI) and mobile applications are used by the digital transforming organizations twice as much as the traditional incumbent organizations as seen in the graphic below. When a new idea fails to produce the desired goals, this is a lesson that can be very helpful in producing the next innovation. In today's world with software-defined networks and data centers, and the ease of application development, we can produce an environment where time-to-market is faster than ever. Ensure that you are monitoring your innovation and getting the feedback you need, so you can determine if the innovation meets your success goals or should be terminated and a new idea tried. Failure should not be a career killer. Failure can be used as a career builder depending on how you react to it. As a business, you can't innovate once. Once you start innovating, you can never relax. If you don't innovate, how long will you last?